How old were you when you discovered Sherlock? 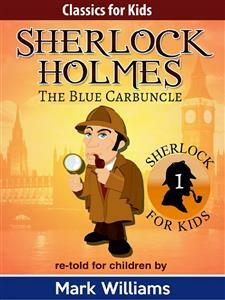 As part of the Classics For Kids series international best-selling author Mark Williams is proud to present this adaptation for children of the Sherlock Holmes short story The Blue Carbuncle. This is the British-English edition. British-English? Although we speak the same language, we spell many words differently depending on which side of the Atlantic we are. UK = colour, US = color; UK = marvellous, US = marvelous; UK = theatre, US= theater, etc. This sometimes causes problem for children at school, so in response to requests from school librarians there are now British-English and American-English versions of the Sherlock For Kids books. Come join Holmes and Watson as they solve the mystery of the blue carbuncle in a child-friendly, twenty-first century English, with the seamier side of Victorian life left out. Ideal for children aged 9-12 to get started with the world’s most famous detective. Other books in the Sherlock Holmes re-told for children series: The Blue Carbuncle Silver Blaze The Red-Headed League The Engineer’s Thumb The Speckled Band The Six Napoleons The Naval Treaty 3-in-1 Box Set - The Blue Carbuncle, Silver Blaze. The Red-Headed League 3-in-1 Box Set - The Engineer’s Thumb, The Speckled Band, The Six Napoleons 6-in-1 Box Set - The Blue Carbuncle, Silver Blaze, The Red-Headed League, The Engineer’s Thumb, The Speckled Band, The Six Napoleons These titles may be available as ebooks, paperbacks and as audio-books. Coming next in the Sherlock Holmes re-told for children series: • The Musgrave Ritual • The Beryl Coronet • The Resident Patient Coming soon from international bestselling author Mark Williams : • When Sherlock Was A Boy – tales from Sherlock’s childhood. It was Boxing Day, the day after Christmas Day, as I made my way carefully through the icy London streets. A cold wind blew light, fluffy snowflakes about and I hoped it wouldn’t snow too heavily that afternoon. The streets were icy and slippery and I found it easier to walk on the straw strewn across the road than on the pavements. By the time I got to my destination I was absolutely freezing. It was high time I bought myself a new coat and gloves! I stomped my boots on the first of the stone steps outside 221b Baker Street, so I would not traipse ice and grit into Mrs. Hudson’s hallway. It had been some time since I had lived here, sharing an apartment with my dear friend Mr. Sherlock Holmes, and I still had a key, so I unlocked the door and let myself in. “Mrs. Hudson!” I shouted through to the kitchen where I knew the lady of the house would be busy. Partly as a courtesy to let her know I was here; more in the hope she would see me shivering and offer a warm pot of tea. Which of course she did, bless her. “That would be most welcome, Mrs. Hudson,” I said. “Of course,” chuckled Mrs. Hudson. “Oh, get away with you, Dr. Watson,” Mrs. Hudson blushed, and she shuffled back into the kitchen, chuckling to herself. I made my way up the stairs to the floor occupied by my dear friend, and knocked once. “Come in, Watson,” Holmes called out. I pushed open the door and the warmth from the blazing fire met me. I put my hat on the hat-stand just inside the door and began taking off my gloves, scarf and overcoat. Holmes dismissed my question with a wave of his hand. I smiled as I put my coat on the peg and walked across to warm my hands in front of the burning coals. It was always so obvious when Holmes explained his logic. My friend Sherlock Holmes was laid out on the sofa, feet up, wearing his favourite purple dressing gown. As a rule Holmes only got dressed if he was going out or if he was expecting visitors. He had been smoking his pipe, and reading the morning’s newspapers, which were now crumpled on the floor. But what immediately caught my eye were the magnifying glass and the forceps on a wooden chair stood next to the sofa, and, hanging from the back of the same wooden chair, a battered old hat. I knew immediately this hat did not belong to Holmes, but the magnifying glass and forceps did, and they told me the hat must be a clue in some new case Holmes was working on.